In 1990, energy in the UK underwent a unique and fundamental transformation, with the privatization of the electricity supply industry. This is the first book to fully assess the experiment. 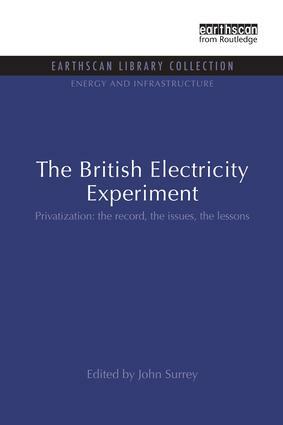 It first explains how – and why – the British electricity supply industry was privatized. It then identifies the subsequent changes in electricity prices, profits, employment, investment, nuclear power and renewable, and the extent to which each of these was due solely to privatization or to other factors, or could have come about by reform of the previous model, rather than privatization. Finally, the authors analyse the key unresolved issues of regulation, introducing competition into the domestic energy market in 1998, supply security, and other long-term strategic considerations. Throughout, the distinguish between the uniquely British elements of the experience and those which can be drawn upon by other countries embarking upon similar reforms. Today, governments throughout the world are looking to the UK's experience as a potential prototype for the restructure of their own electricity supply industries. For them, and for electricity utilities, fuel and power plant suppliers, regulation authorities, financial analysts, international agencies, journalists and academics alike, this thorough and pragmatic study will be essential reading. Renewable Generation - Success Story?